These be jokes 41 - 45 of 300 scurvy jokes! What did the pirate say when he crashed his ship upon the iceberg??? Why did the pirate buy an eyepatch? Because he didn't have enough money for an iPad!!! What's a pirates favorite thing to do with a cell phone? What did the pirate get when he hit the skeleton? 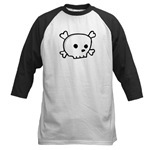 A skull and very CROSS bones!